To Cite: Mohammadpourhodki R, Rahnama M, Abdollahimohammad A, Shashraki Vahed A, Shamsizadeh M, et al. Comparison of effect of Nursing Education and Peer Education Methods on Self-Efficacy in Patients with Myocardial Infarction, Mod Care J. 2018 ; 15(1):e56012. doi: 10.5812/modernc.56012. Background and Objectives: Following a doctor’s orders in regards to diet and activity is very important for patients with myocardial infarction. Self-efficacy is an important tool for active participation in treatment and change in behavior. Thus, this study aims to compare the effects of nursing education and peer education on cardiac self-efficacy in patients with acute myocardial infarction. Methods: The present study is a randomized clinical trial (RCT) performed on 60 patients with acute myocardial infarction. These patients were randomly divided into 2 groups of control (nurse education) and interaction (peer education). The cardiac self-efficacy rate in the two groups was investigated by filling out the cardiac self-efficacy questionnaire after the intervention (3 days after a heart attack) as well as 5 days and 4 weeks after the heart attack. Data was analyzed using independent t-test, chi-square, Fisher’s exact test, and RM-ANOVA. Conclusions: Considering the shortage of nurses in hospitals, it is recommended that it is better to use this training method instead of the training of nurses. Myocardial infarction is the most common cardiovascular disease (1). An American suffers a heart attack every 20 seconds (2). Half the deaths in Iran, which occur after cardiovascular disease, are due to myocardial infarction (3). Subsidies worth 15 billion Rials were spent annually for treatment in Iran, while $50 million were spent annually on the purchase of medical equipment (1). The lack of follow-up treatment and care regimes is an important factor in increasing the risk of complications, increasing mortality and morbidity, as well as rising health care costs (4). Therefore, the empowerment of people with coronary artery disease for self-care can prevent these complications of the disease, or delay their onset. In this regard, Sol et al. (2006) reported that patients with cardiovascular disease can effectively control and manage the signs and symptoms of their disease by improving self-efficacy (5). Watson also believes that self-efficacy is an important determinant of health behaviors in patients with cardiovascular diseases and that it plays a role in facilitating behavior change and in promoting health (6). Therefore, patients with acute myocardial infarction should be routinely checked in terms of cardiac self-efficacy. In addition, some measures should be performed to promote their self-care behaviors to increase their self-efficacy. One of these measures is to inform and educate the patients about the disease and its treatment (7). Patients’ education increases their understanding of disease, treatment, and related problems; it can also have a positive impact on performance and physical condition of the patient, and improve quality of life, increase compliance with existing conditions, and decrease emotional problems (8). Patient education is one of the most important aspects of nursing activity (9); this is apparent from the world health organization reports and from numerous trials’ results. It can also be seen in nursing resources, where the effective role and importance of participation of nurses in consulting roles and nurse education is emphasized (10). There are several methods of patient education, for example individual or face-to-face training (11). In this method, behavior change for the betterment of patients is possible due to pair discussion and confrontation (9). Despite advantages of this method, there are some existing limitations such as considerable expenditure of time, cost, and personnel resources (12). Considering the shortage of nurses in hospital wards of our country, which indicates they do not have enough time to communicate and educate patients, peer education can be used as an auxiliary method in solving this problem (13). Peer education is defined as the “exchange of information, attitudes, and behavior by those who are not trained professionally in that, however, they have common experiences (14). In this educational approach, a simple and secure learning environment is created according to similar characteristics of the members; in addition, patients share their experiences in relation to the same disease from which they are suffering (15). This tactic is derived from Bandura’s social learning theory on the basis that people learn imitation and modeling from each other through observation (16). Peer education is a sustainable approach in which the peer can make a long-term friendly and intimate relationship with the patient and share her information with him (14). Generally, educating and improving self-efficacy of patients with myocardial infarction is important in taking care of her (4). However, since researchers have shown low adequacy of nurses’ performance in this regard and the country’s shortage of nurses in hospitals (13), the necessity of adopting other alternative methods has been felt along with nurse education. Peer training can be useful in solving this problem: peers can encourage patients to choose appropriate healthy behavior due to having better shared experiences (15). Therefore, this study aims to investigate the effect of peer education compared with the effect of nurse education on cardiac self-efficacy in patients with myocardial infarction. 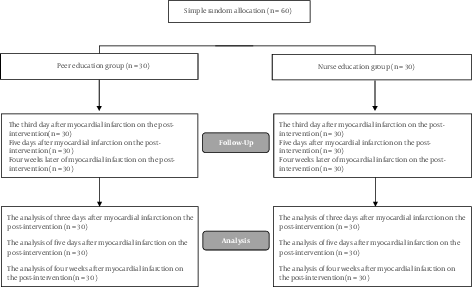 The present study is a randomized clinical trial (RCT) research in which 60 patients with myocardial infarction were admitted to the CCU of the Amiralmomenin hospital in Zabol in 2015 and were simple randomly allocated into (in between)” is CORRECT 2 groups of intervention group (peer education) and control group (nurse education). Inclusion criteria were: myocardial infarction diagnosed for the first time based on the world health organization recognition program, lack of psychological disorders, (according to the case documents), lack of hospitalization in CCU due to myocardial infarction, having hemodynamic stability, being aged between 30 - 60 years old, not having cases of anxiety and depression, ability to read and write, ability to speak in Farsi, willingness to participate in research, and possibility of contact by telephone. Exclusion criteria were: death of patient during the study, loss of ability of self-care in the patient, and with drawl from the study. Determination of sample size was based on the mean difference between intervention and control groups as suggested by Parent and Fortin (17). There were 2 tools for data collection in this study (1). Patient demographic data questionnaire, consisting of 2 parts: the 1st section had questions about personal details such as age, education, and marital status, while the 2nd section had questions about health status information such as a history of drug abuse, a history of diabetes, and blood pressure these were set after reading books and articles and consultation with professors specializing in cardiovascular diseases (2). Cardiac self-efficacy questionnaire was the 2nd questionnaire. Validity and reliability of the cardiac self-efficacy questionnaire was confirmed by Varaei et al. (2014), wherein the “Total scale Content Validity Index CVI was 91.33”. Internal consistency method was used to assess reliability of the questionnaire. Tools were available for 30 patients who were candidates for surgery of CABG: Cronbach’s alpha coefficient was calculated to be 0.977. The questionnaire consisted of 16 questions; the answers in this questionnaire were scored on the basis of the Likert scale ranging from 0 (not at all certain) to 4 (pretty sure). The higher the individual score, the higher the self-efficacy (18). This questionnaire was completed before intervention by both intervention and control groups. Thereafter, the intervention began with selection of the peer. A total of 3 patients, 3 men and 1 woman, who had a history of myocardial infarction were selected as peers. Selecting peers was carried out on the basis of attributes. These were: volunteering as a peer for cooperation in research, having at least a high school education, and not having any anxiety, even mild anxiety based on Spielberger’s manifest anxiety questionnaire. Peers were taught by the researcher during 3 sessions. Each of these sessions lasted about 90 minutes. The educational content was determined with reference to the purpose of the study. In the 1st session, the concepts, importance and advantages of peer education, communication skills, and stress reduction strategies were taught. In the 2nd session, the amount of physical activity, controlling shortness of breath, fatigue, chest pain, weight, diet, regular and social activity level, treatment follow-up, and marital relationship with wife were taught. In the 3rd session, other needs such as medications and nutrition were taught. Peer education was relied on lectures, question and answer sessions, as well as appropriate use of audiovisual aids. After peers’ education, researcher assessed the training materials using a checklist in order to ensure their preparedness and integration of education. Peers were allowed to enter the next stage only if they followed all the trained items during the 3 sessions. Thereafter, they were permitted to educate the patients: educational intervention was conducted for the intervention group by the peer (supervised by the researcher) and for the control group by the nurse on the 3rd day after the heart attack. Training was provided for 2 sessions per hour in face-to-face and single ways. The interval between the sessions would increase depending on the patient’s tolerance and request. In the intervention group, peers talked about teaching their experiences from hospitalization to discharge and manner of self-care, focusing specifically on self-efficacy. According to the number of patients in the intervention group (30 people), each peer trained 10 patients who were randomly divided among them. In the control group, educational content was similar to the peer group. After providing educational intervention for both groups, the self-efficacy questionnaire was completed by both groups 5 days and 4 weeks after the heart attack. It should be noted that the questionnaire was completed a few weeks after the heart attack by telephone follow-up. This randomized clinical trial (RCT) study received a research ethics committee license from Zabol University of Medical Sciences with a code of zbmu.1.REC.1394.136. Ethical considerations were observed in this study. Statistical analysis of results was conducted using the SPSS-19 software in 2 parts of descriptive and inferential statistics. Descriptive statistics was used to describe data frequency: independent t-test and chi-square test were used to compare the data, and two-way variance analysis was used for hypothesis of having different anxiety mean scores in 2 groups with repeated measurements (Figure 1). The findings of this research showed that the demographic profile of patients is identical in both groups of peer education and nurse education. The majority of subjects were male, married, self-employer, and living in city (Table 1). aValues are expressed as No. (%) or mean (standard deviation). Table 2 shows there is no difference in self-efficacy means between the peer education and nursing routine education before the intervention. The RM-ANOVA test shows a significant difference in self-care efficacy after intervention between 2 groups of study (Table 3). The findings of this study show that the self-efficacy of both groups improved after the intervention. However, a comparison of the averages’ shows that increase in the self-efficacy rate in the intervention group (peer education) is significantly more than the control group (nurse education). In other words, patients who had received peer education had higher self-efficacy as compared to patients who had received nurse education. Significantly, this researcher did not find any similar study after literature review conducted in different databases and resources. Hence, the discussion of results is necessarily somewhat close to this study. In addition, some of these studies had been performed on patients without heart disease; however, the researcher pointed this out to them as a limitation of existing research in this area. The results from studies of Sol, Yeh, Murphy, Boroumand, Kang and Yang, Millen, and Bray show that educational interventions have a positive effect on the cardiovascular self-efficacy, and that self-efficacy improves significantly after the training program (5, 19-23). Results of all the studies described above are in line with the results of this study. In other words they confirmed these results. In the context of peer education, we can mention the study of Parent and Fortin in 2000: this aimed to determine the effect of empathy peer-based support on anxiety, self-efficacy, and self-reported activity of men who had heart surgery for the first time. The results showed that cardiac self-efficacy significantly increased on the 5th day and the 4th week post-intervention in patients of the peer education group as compared with patients in the control group (17). Varaei et al. (2014) carried out a study entitled “Effects of peer education on cardiac self-efficacy and readmissions in patients undergoing coronary artery bypass graft surgery: a randomized-controlled trial.” The average of cardiac self-efficacy of 60 patients was studied on the 5th day and 4th week post-intervention by using two-way analysis of variance (ANOVA) with repeated measures. The results showed that there is significant statistical difference between the mean score of self-efficacy in the peer group as compared to the control group in both phases of data collection (P < 0001) (18). Hiesler (2010) in USA carried out a study entitled “The impact of peers’ support on self-care in diabetic patients”: the results showed that peer education has led to increased self-care behavior, decreased hemoglobin A (HbA (1C)), proper use of medications, and reduced need for insulin in the intervention group as compared with the control group (24). The afore mentioned studies are consistent with this research. In this educational approach, a simple and secure learning environment was created according to shared characteristics of the members: patients shared their experiences in relation to the disease, which all of them were suffering from (15). Patients can benefit from these experiences in order to improve the symptoms. The results of the above studies in this field suggest that use of peer groups instead of involving health care professionals such as doctors, nurses, etc. can be beneficial in order to change the behavior of patients, especially patients with chronic diseases (13). Considering the shortage of nurses in the country and given that hospitals believe they do not have enough time to communicate and educate patients, peer education can be useful in solving this problem. Hence it is recommended that this educational method be used along with nurse education. This article is part of a thesis research project with the ethics code zbmu.1.REC.1394.136 in Zabol University of Medical Sciences. It has been undertaken with the financial support of the university: we appreciate this support. We appreciate and thank vice-chancellor of the Zabol University of Medical Sciences, respected officials of the Zabol Amiralmomenin Hospital, nurses, peers, and all the patients who helped us in this project. 1. Mohammadpoor HR, Rahnama M, Abdollahimohammad A, Shahraki VA, Shaamsizadeh M. A comparison of the effect of training by peers and nurses on anxiety in patients with myocardial infarction: A randomized control trial. Prevent Care Nurs Midwifery J. 2016;6(3):12-23. 2. Moghadam MB, Zeighami R, Azimian J, Jahanihashemi H, Fotuhi M. Side Effects of Intravenous Streptokinase in Different Age Groups Patients with Acute Myocardial Infarction. Armaghane Danesh Bimonth J. 2014;18(11):910-7. 3. Naghavi M, Jafari N. Mortality in the 29 provinces of Iran in 2004. Tehran: Vice-chancellor for health, ministry of health and medical education; 2007. Persian. 4. Hoseinzadeh T, Paryad E, Asiri S, Kazem Nezhad Leili E. Relationship between perception of illness and general self-efficacy in coronary‎artery disease patients. J Holistic Nurs Midwifery. 2012;22(1):1-8. Persian. 5. Sol BG, van der Graaf Y, van der Bijl JJ, Goessens NB, Visseren FL. Self-efficacy in patients with clinical manifestations of vascular diseases. Patient Educ Couns. 2006;61(3):443-8. doi: 10.1016/j.pec.2005.05.011. [PubMed: 16009526]. 6. Holloway A, Watson HE. Role of self-efficacy and behaviour change. Int J Nurs Pract. 2002;8(2):106-15. [PubMed: 11993577]. 7. Moniei R. Development of distance education in higher education, opportunities and challenges. Rahyaft. 2004;31(2):43-52. 8. Shokraiean N. Comparison of the effect of face to face teaching and the educational booklet on the patient’s learning after urologic surgical procedures. J Nurs Educ. 2012;1(1):70-7. 9. Karimi Moonaghi H, Hasanzadeh F, Shamsoddini S, Emamimoghadam Z, Ebrahimzadeh S. A comparison of face to face and video-based education on attitude related to diet and fluids: Adherence in hemodialysis patients. Iran J Nurs Midwifery Res. 2012;17(5):360-4. [PubMed: 23853648]. 10. Abazari P, Amini M, Amini P, Sabouhi F, Yazdannik A. Diabetes nurse educator course: from develop to perform. Iran J Med Educ. 2011;10(5). 11. Mousavi SS, Sabzevari S, Abbaszade A, Hosseinnakhaie F. The effect of preparatory face to face education to reduce depression and anxiety in open heart surgery adult patient in Shafa hospital in Kerman, 2008. Iran J Nurs Res. 2011;6(21):29-38. 12. Wofford JL, Wells MD, Singh S. Best strategies for patient education about anticoagulation with warfarin: a systematic review. BMC Health Serv Res. 2008;8:40. doi: 10.1186/1472-6963-8-40. [PubMed: 18275605]. 13. Borzou R, Bayat Z, Salvati M, Homayounfar S. A comparison of Individual and Peer Educational Methods on Quality of life in patients with heart failure. Iran J Med Educ. 2014;14(9):767-76. 14. Varaei S, Cheraghi MA, Seyedfatemi N, Talebi M, Bahrani N, Dehghani A. Effect of peer education on anxiety in patients candidated for coronary artery bypass graft surgery: a randomized control trial. J Nurs Educ. 2013;2(3):28-37. 15. Dehghani A, Hojati H, Shamsizadeh M. The effect of peer-led education on depression of multiple sclerosis patients. Iran J Psychiatr Nurs. 2013;1(1):63-71. 16. Dehghani A, Mohammadkhan Kermanshahi S, Memarian R, Baharlou R. The effect of peer group education on anxiety of patients with multiple sclerosis. Iran J Med Educ. 2012;12(4):249-57. 17. Parent N, Fortin F. A randomized, controlled trial of vicarious experience through peer support for male first-time cardiac surgery patients: impact on anxiety, self-efficacy expectation, and self-reported activity. Heart Lung. 2000;29(6):389-400. doi: 10.1067/mhl.2000.110626. [PubMed: 11080319]. 18. Varaei S, Shamsizadeh M, Cheraghi MA, Talebi M, Dehghani A, Abbasi A. Effects of a peer education on cardiac self-efficacy and readmissions in patients undergoing coronary artery bypass graft surgery: a randomized-controlled trial. Nurs Crit Care. 2017;22(1):19-28. doi: 10.1111/nicc.12118. [PubMed: 25349051]. 19. Yeh GY, Chan CW, Wayne PM, Conboy L. The Impact of Tai Chi Exercise on Self-Efficacy, Social Support, and Empowerment in Heart Failure: Insights from a Qualitative Sub-Study from a Randomized Controlled Trial. PLoS One. 2016;11(5). e0154678. doi: 10.1371/journal.pone.0154678. [PubMed: 27177041]. 20. Murphy BM, Higgins RO, Shand L, Page K, Holloway E, Le Grande MR, et al. Improving health professionals' self-efficacy to support cardiac patients' emotional recovery: the 'Cardiac Blues Project'. Eur J Cardiovasc Nurs. 2017;16(2):143-9. doi: 10.1177/1474515116643869. [PubMed: 27071738]. 21. Boroumand S, Moeini M. The effect of a text message and telephon follow-up program on cardiac self-efficacy of patients with coronary artery disease: A randomized controlled trial. Iran J Nurs Midwifery Res. 2016;21(2):171-6. 22. Kang Y, Yang IS. Cardiac self-efficacy and its predictors in patients with coronary artery diseases. J Clin Nurs. 2013;22(17-18):2465-73. 23. Millen JA, Bray SR. Promoting self-efficacy and outcome expectations to enable adherence to resistance training after cardiac rehabilitation. J Cardiovasc Nurs. 2009;24(4):316-27. doi: 10.1097/JCN.0b013e3181a0d256. [PubMed: 21206354]. 24. Heisler M, Vijan S, Makki F, Piette JD. Diabetes control with reciprocal peer support versus nurse care management: a randomized trial. Ann Intern Med. 2010;153(8):507-15. doi: 10.7326/0003-4819-153-8-201010190-00007. [PubMed: 20956707].